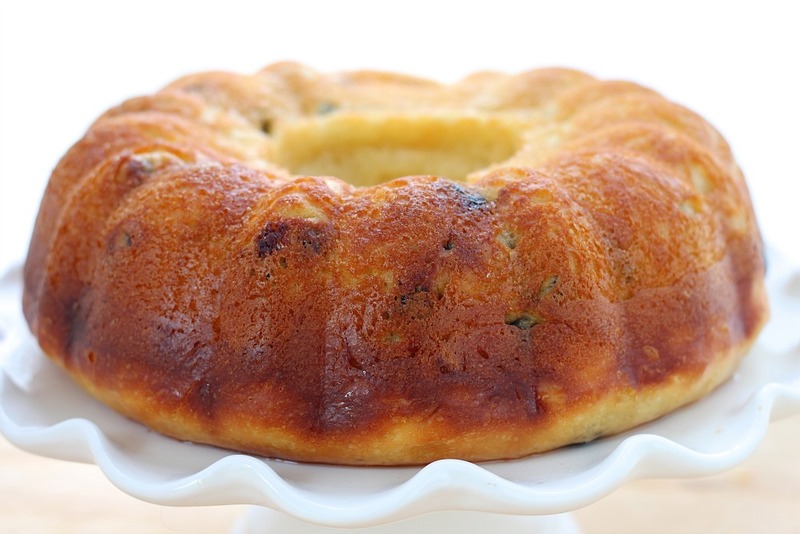 A rich, no knead yeast cake, baked in a bundt pan and soaked with a rum flavored sugar syrup. Measure 1¾ cups of the flour into a large mixer bowl. Add the yeast, blend. Measure water, milk, butter, sugar and salt into a pan. Heat until warm (120°-130°F), stirring constantly. Pour into flour-yeast mixture. Mix until just combined. Add eggs. Beat ½ minute with electric mixer on low speed, scrape bowl. Beat 3 more minutes at high speed. STOP MIXER. Blend in the rest of the flour, currants, and extract. Cover bowl. Let rise in warm place until doubled, about 30 to 45 minutes. Turn into buttered 12-cup Bundt pan or 2-quart turban mold, OR 12 individual baba or ring molds filling half full. Let rise until doubled, about 45-60 minutes. Bake in preheated 350°F oven for 25 to 35 minutes for large mold, OR 15 to 20 minutes for small molds, or until cake tester comes out clean . Cake will be golden brown. Cool in pan for about 15 minutes. ** Prick cake with fork while in pan, then invert, remove from pan, and prick again. Pour hot Syrup* over cake, a little at a time until Syrup is absorbed. *Rum-Lemon Syrup - Boil sugar in water for 8 to 10 minutes. Remove from heat and stir in rum extract and lemon juice. Pour syrup over Baba a little at a time and let stand until Syrup is absorbed. Invert cake onto a wire rack and cool completely. While cake is cooling, make syrup (but only use 2 cups water and 1 cup sugar, rum extract and lemon juice are the same amounts). With a spoon, gently pour about ⅓ cup syrup on top of the cake. Let the cake absorb the syrup before pouring another ⅓ cup. With a serrated knife, cut the cake in half (about 1 inch thick the upper slice). Remove the top slice. With a spoon pour ⅔ cup syrup over the bottom slice. Let the syrup soak in. With a spatula, spread the cream over the bottom slice. Place the strawberries on top of the cream. 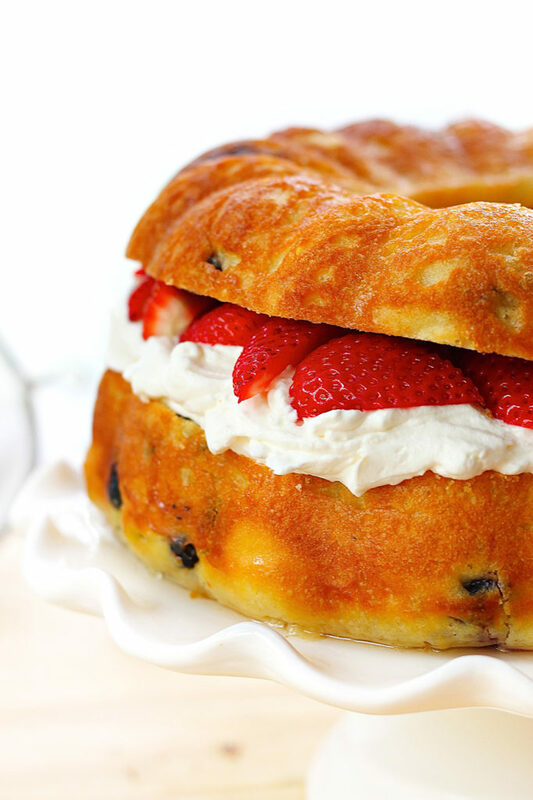 Gently, place the top cake slice over the strawberries. Pour the remaining syrup and let the cake soak for an hour or so. Thanks for this recipe. Baba au rhum was mentioned in my French grandmother’s life history and I wanted to try it out. Being a teetotaler, it was difficult to find a recipe that worked and this one does. Thanks for putting the recipe up.